*1: For additional information, see вЂњengine oil recommendationвЂќ. *2: As an alternative to this recommended oil, sae 5w-30 conventional petroleum based oil may be used and meet all specifications and requirements necessary to maintain the new vehicle limited warranty. *3: Use only genuine nissan cvt fluid ns-3, using automatic transmission fluid other than genuine nissan cvt fluid ns-3 will damage the cvt, which is not covered by the nissan new vehicle limited warranty. 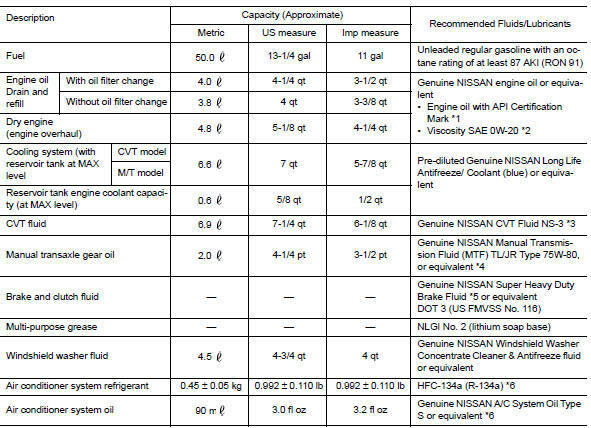 *4 If genuine nissan manual transmission fluid (mtf) tl/jr type is not available, api gl-4+, viscosity sae 75w-80 may be used as a temporary replacement. However, use genuine nissan manual transmission fluid (mtf) tl/jr type as soon as it is available. *5: Available in mainland u.S.A. Through a nissan dealer. *6: For additional information, see "air conditioner specification label". Nissan recommends the use of an energy conserving oil in order to improve fuel economy. Select only engine oils that meet the american petroleum institute (api) certification and international lubricant standardization and approval committee (ilsac) certification and sae viscosity standard. These oils have the api certification mark on the front of the container. Oils which do not have the specified quality label should not be used as they could cause engine damage. Do not remove the radiator or coolant reservoir cap when the engine is hot. Wait until the engine and radiator cool down. Serious burns could be caused by high pressure fluid escaping from the radiator. When adding or replacing coolant, be sure to use only genuine nissan long life antifreeze/coolant (blue) or equivalent. Genuine nissan long life antifreeze/coolant (blue) is pre-diluted to provide antifreeze protection to -34В°f (-37В°c). If additional freeze protection is needed due to weather where the vehicle is operated, add genuine nissan long life antifreeze/coolant (blue) concentrate following the directions on the container. If an equivalent coolant other than genuine nissan long life antifreeze/coolant (blue) is used, follow the coolant manufacturerвЂ™s instructions to maintain minimum antifreeze protection to -34В°f (-37В°c). The use of other types of coolant solutions other than genuine nissan long life antifreeze/coolant (blue) or equivalent may damage the engine cooling system. Mixing any other type of coolant other than genuine nissan long life antifreeze/coolant (blue), including genuine nissan long life antifreeze/coolant (green), or the use of non-distilled water will reduce the life expectancy of the factory-fill coolant.